"Fire and ice combine for under"
In this stage, play as either Iceman or Fireman to experience two completely different paths which merge at the end. 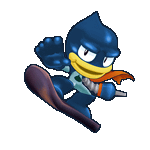 Iceman must deal with freezing enemies and firespouts to progress, while Fireman must deal with shortened attack range underwater and melting blocks above. Oilman's also peppered the place with timebombs, waterspouts, and Fire and Ice Blocks to make Firman and Iceman's lives tougher. Good luck convincing Oilman to clean up that oilslick! A level that makes the obstacles to be crossed in 2 very different ways. The fact that it actually makes good use of Iceman is already enough to warrant a 5 and Fireman's path is very good too. Very original Fire & Ice Man level, where IceMan gets the top half, and Fire Man gets the bottom path. This stage was a little bit more challenging for FireMan since he had to get through most of the level submerged, while avoiding spikes, clearing Fireblocks out of the way, and riding on some walking timebombs. Most of the floating fireblock and time-bomb puzzles were set up in an incredibily clever manner, but don't take long to figure out, which is a perfect combination. There were also a few challenging melting snow platforms for Fireman, combined with lots of spikes and walking time-bombs. 4 out of 5 helmets. WOW!! If you ever ask me if i want to "Freeze or Burn", i'll go with the latter. I played as Fire Man for this one, and i can see that it was well made, mixing up ice blocks and fire blocks. Playing as Ice Man, you had to shoot the ice blocks, while playing as Fire Man, you had to shoot fire blocks. Very original work, V-Edgy! Here's the notes to prove my point. Well, uh... actually... I give you 5 on all categories. That was REALLY COOKIN'!!! Nice job, Veridianedge. That was fantastic. I'm impressed.